Stalin famously had a buzzer installed to let his sweating henchmen know when it was finally safe to stop applauding the Great Leader without fear of being sent to the Gulag. In this era when it’s nearly mandatory to greet each new black cultural product as effusively as if it were a cross between the Five Year Plan and a Special Olympics gold medalist, it’s difficult to tell the frauds, such as Kehinde Wiley, the self-promoting Photoshopper culpable for Obama’s humiliatingly incompetent official portrait, from the sincere mediocrities, such as Ta-Nehisi Coates, from the competent professionals, such as Ryan Coogler, director of the vastly overhyped but not-bad movie Black Panther. Coogler, the young black director of the fine Rocky franchise movie Creed in which Apollo Creed’s son enlists the aged Rocky Balboa as his trainer, benefited from the Marvel superhero factory’s usual quality control. Plus, he was granted a $200 million budget rather than Marvel’s typical $150 million budget. And he was allowed to make more of a stand-alone movie than the usual Marvel Universe pictures, which are often mostly just a way to get from, say, Point P to Point R in studio boss Kevin Feige’s vast master plan. Still, Black Panther is more interesting than entertaining, being short on humor and star power. To the politically minded, the Wakanda of ‘Black Panther’ offers an almost too perfect rebuttal to President Trump’s comments in January in which he referred to African nations with a disparaging expletive. I mean, does Norway have vibranium-powered flying cars like Wakanda does? Unfortunately, while Black Panther has its strong points, it’s still just a comic-book movie. Marvel doesn’t pay its actors well (unless you are Robert Downey Jr.), so the nearly all-black cast is drawn from the junior varsity. 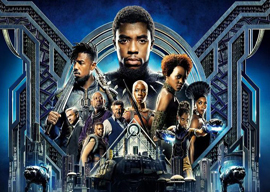 As royal cousins battling for the throne of Wakanda, a reactionary utopia set in deepest Africa, Chadwick Boseman (as the wise king of Wakanda) and Michael B. Jordan (as his radical cuz from Oakland) are serviceable but not charismatic. Two previous fantasy movies about African monarchies, Eddie Murphy’s Coming to America (the third-biggest box office hit of 1988) and the animated Lion King (one of the most profitable properties ever, when the immense stage revenues are counted in), featured far more star power, with, for instance, James Earl Jones playing the elder king in both. Moreover, Coogler’s staging of Black Panther’s many fights is choppy and repetitious, his dialogue is self-serious, there are too many minor characters to keep track of, and the film runs too long. On the plus side, Black Panther’s blatant conservatism is an intriguing example of how most of this decade’s cultural energies are flowing toward the right, even when disguised by worship of blacks. Since its first self-produced film, 2008’s Iron Man with Robert Downey Jr., Marvel has tilted subtly to the right. For example, Iron Man 2 in 2010 was the first movie I can recall that dared even briefly to satirize Obama. Wakanda is a sort of black Zion mixed with the governmental structure of Israel’s new best friend forever, Saudi Arabia, augmented by the xenophobic policies of Japan during the Tokugawa shogunate. This lost kingdom is a hereditary absolute monarchy, although, movie reviewers are quick to note, it’s actually a democratic and progressive hereditary absolute monarchy because when the crown prince inherits the throne, anyone of royal blood is entitled to challenge him to a duel to the death. As the popularity of Coming to America, The Lion King, and the 1885 best-selling novel King Solomon’s Mines attests, outsiders have long felt Africa should have more kings. While monarchies might be old hat in the West, they would have been a step up for most of Africa, due to precolonial Africa being stuck at a lower level of political development from its disease-driven lack of urbanization. Unfortunately, the recent history of kingship in Africa is less edifying than the fiction. Coogler says his film was inspired by visiting Lesotho, a high-altitude southern African nation that had avoided most colonialism. The Lesotho influence can be seen in Black Panther’s scenes set above Wakanda’s snow line: Lesotho is a rare sub-Saharan country with a ski hill. About 40% of the population lives below the international poverty line of $1.25 a day…. In urban areas, about 50% of women under 40 have HIV. With AIDS becoming less lethal, life expectancy in Lesotho is recently back up to 50 years.